Using the Extract Storyboard dialog, you can extract parts of your storyboard into their ownprojects. This allows you separate your project into smaller projects, each one representing a chunk of the original storyboard. You can then share these extracted projects with project collaborators so that several artists can work on their assigned part of the project simultaneously. You can extract all but one part of the project into smaller projects, and keep the remaining part in the current project. Later, you can assemble the extracted projects back with the current project using the Merge dialog—see Merging Storyboard Projects. You can every part of your project into smaller projects and keep the current project as a master project. Later, you can assemble the extracted projects back into the master project using the Merge and Replace dialog—see Merging Projects and Replacing Scenes in the Current Project. 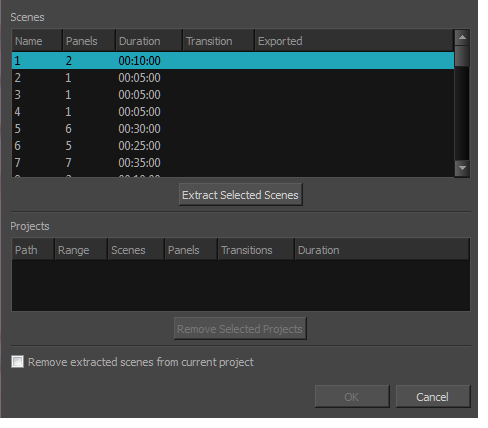 IMPORTANT If you want to keep the extracted scenes in the original project, and later import the changes made to the extracted projects back into the original project using the Merge and Replace dialog, it is highly recommended to lock you project's scene and panel numbers before splitting your project. To do this, in the top menu, select Storyboard > Lock Scene and Panel Names. Click and hold on the first scene that you want to select, then drag the mouse cursor down to the last scene you want to select. Select the first scene that you want to select. Then, while holding Shift or Ctrl, click on the last scene you want to select. Click on Extract Selected Scenes. In the file browser dialog that appears, browse to the location where you want to extract the selected scenes. Type in a name for the project in which you want to extract the selected scenes. If you want to change the way you separated your project, you can select one of the projects to extract from the Projects list and click on Remove Selected Project until all the chunks you wish to change are removed, then separate these chunks again the way you want them to be separated. If you want the scenes that you are extracting from the current project to be removed from the current project, check the Remove extracted scenes from current project option. Otherwise, if you want to keep the current project intact so that it is a master project, leave this option unchecked. Project folders containing the extracted projects will be created in their selected destinations, with their chosen project names.